The weekend is upon us, and I'm getting ready to head out, brave the cold and run some errands. But before I jet off for the day, I wanted to share a sweet Thrifted Kitchen recipe with you that's perfect for your Valentine's Day celebration! Hopefully you didn't get enough of the heart cake from yesterday, because today takes that shape and give it a feathery, feminine touch. The original recipe comes from Betty Crocker's Party Book, published in 1960, and calls for plain white coconut. But I wanted to amp it up a bit, so I dyed one bag of coconut flakes pink. You can do this by emptying the bag of coconut into a large bowl and adding two to three drops of red food coloring (I know it doesn't seem like enough, but after you work it for a while, it is plenty!). I had the gel kind on hand, which worked well. I also cut out some pink hearts from paint swatches and hot glued them onto skewers to give the top some whimsy. The actual cake is made from a white cake box mix, but obviously you can use whatever recipe you want, just as long as it makes two layers. The filling that was suggested in the book was Betty Crocker's lemon filling, which I found online. And the icing was a whipped butter cream I bought at the store. For once I didn't experience any hiccups (knock on wood); just have some patience when putting the coconut on the cake. Make sure there is plenty of icing and really press down on it so it sticks. I would suggest doing it over the bowl so the excess that falls off doesn't get wasted...also because it's a messy job! Bake white cake mix batter in heart-shaped pans. When cool, put together with a lemon filling. Frost with white frosting. 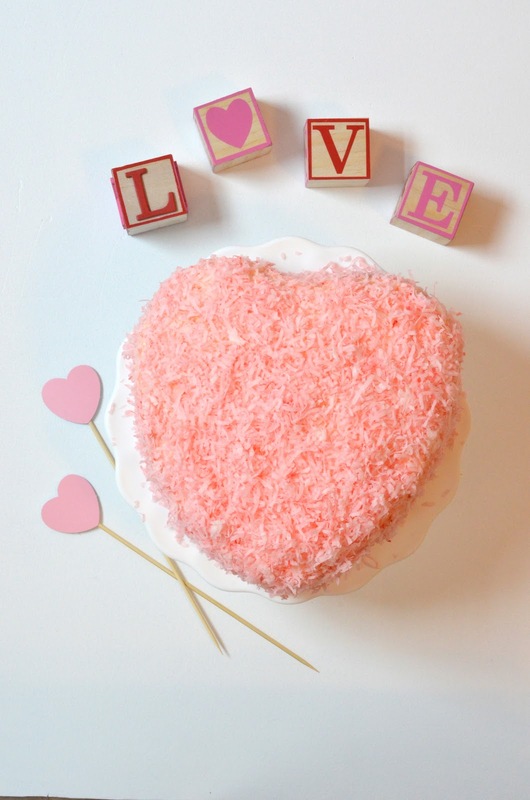 Sprinkle top and sides of cake thickly with shredded coconut. In a 1 1/2-quart saucepan, mix sugar, cornstarch and salt. Gradually stir in water. Cook and stir over medium heat until mixture thickens and boils. Boil and stir one minute longer; remove from heat. Stir in butter and lemon peel until butter is melted. Gradually stir in lemon juice. Press plastic wrap on filling to prevent a tough layer from forming on top. Refrigerate about two hours or until set. Leftover filling can be tightly covered and refrigerated up to five days; do not freeze. Let stand 30 minutes at room temperature to soften; stir before using. Store cakes or pastries filled with lemon filling covered in refrigerator. 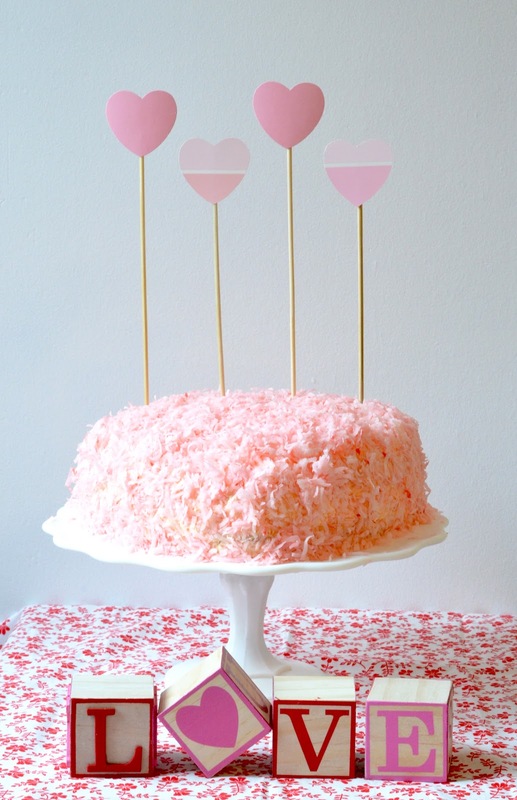 Hope this leaves you inspired to bake up your own Valentine's treats this weekend! This looks amazing!! Can't wait to try it. Love the pics they are so creative. Love it! I want to try this... :) PS Fabulous blog!